Today bring to Me all mankind, especially all sinners, and immerse them in the ocean of My mercy. In this way you will console Me in the bitter grief into which the loss of souls plunges Me. Eternal Father, turn Your merciful gaze upon all mankind and especially upon poor sinners, all enfolded in the Most Compassionate Heart of Jesus. For the sake of His sorrowful Passion show us Your mercy, that we may praise the omnipotence of Your mercy for ever and ever. Amen. © Marian Fathers of the Immaculate Conception of the B.V.M. 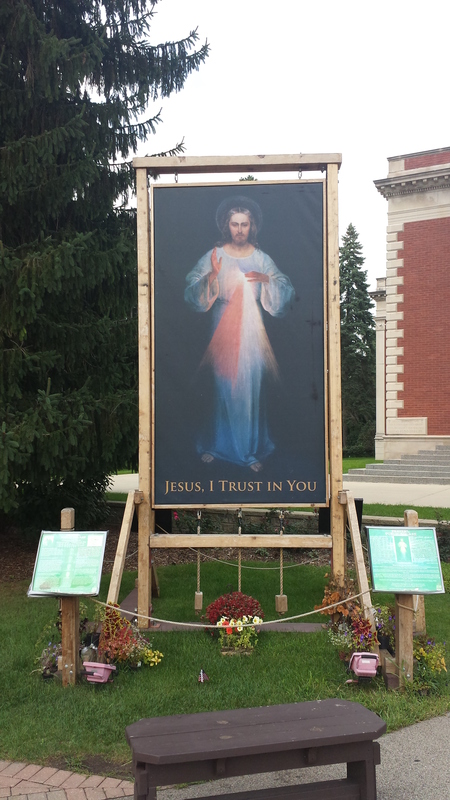 The Divine Mercy Image, displayed outside The Chapel of Our Lady of the Blessed Sacrament, Marytown, Libertyville, Illinois, when it was on display, August 2014.